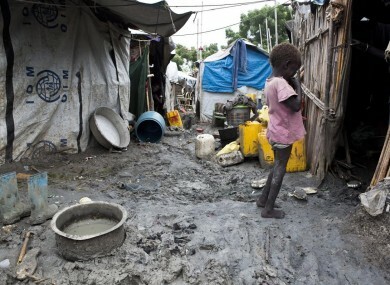 THERE COULD BE a famine in parts of South Sudan next year, according to a group of leading Irish aid agencies. The number of people facing dangerous levels of hunger is expected to increase by one million between January and March next year - if the nine-month long conflict escalates as expected. Concern, Christian Aid, Goal, Oxfam, Tearfund, Trócaire and World Vision launched a report “From Crisis to Catastrophe”. The agencies are calling for the wider international community to redouble diplomatic efforts to put real pressure on the conflict parties to end the fighting – including an arms embargo. They said so far the international community’s ‘softly-softly’ approach to the peace talks has failed. They also added that there needs to be an increase in both the quantity and quality of the aid effort. If famine comes to South Sudan it will come through the barrel of a gun. This is a man-made crisis not one caused by the vagaries of the weather and though humanitarian aid is vital it cannot fix a political problem. The aid agencies said that a mixture of significant aid, a lull in the fighting due to the wet season and the ability of the South Sudanese to cope with hardship, has managed to stave off a famine for the moment. However they warned that now that the wet season is over, an upsurge in fighting is likely, setting back any gains made in the last few months and potentially pushing areas into famine by March 2015. Since the current round of conflict began in South Sudan in December 2013, the country has been pushed to the brink of disaster. However the international aid effort has saved thousands of lives, much of it generously funded by the US, the UK and the EU who have given 60% of the total funding. The UN Mission in South Sudan has opened its compounds to around 100,000 civilians, saving them from ethnic violence, and peace negotiations led by South Sudan’s neighbours have come close to brokering a deal. South Sudan stands on the edge of a catastrophe. The situation is already dire but without urgent political action millions will face starvation. Email “'If famine comes to South Sudan it will come through the barrel of a gun'”. Feedback on “'If famine comes to South Sudan it will come through the barrel of a gun'”.